It's beginning to feel a lot like Christmas in our home. 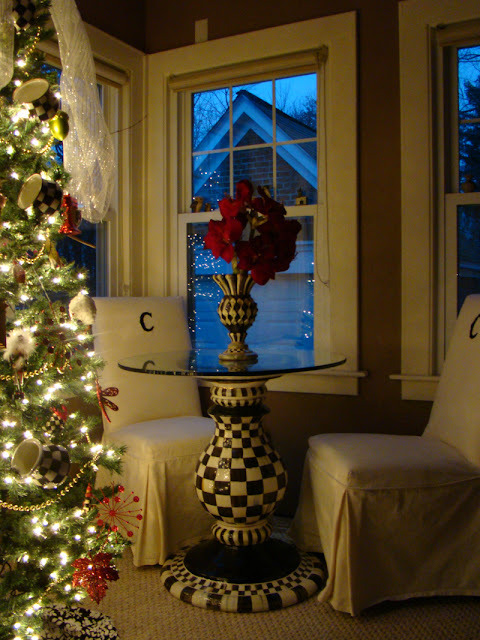 The tree in our sun room has taken on a Mackenzie- Childs theme. I used the same ornaments as last year, and added a few new ones with a snowman topper that I found at Cracker Barrel in September. It was the last one so I guess I was lucky since I rarely shop for Christmas decor in September. I made a scarf using mesh that comes on a roll. 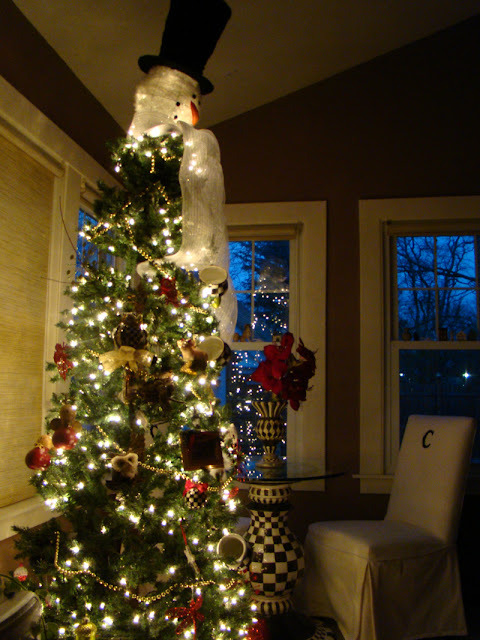 The tree is so tall with the topper that it is hard to get the entire hat in the photo. 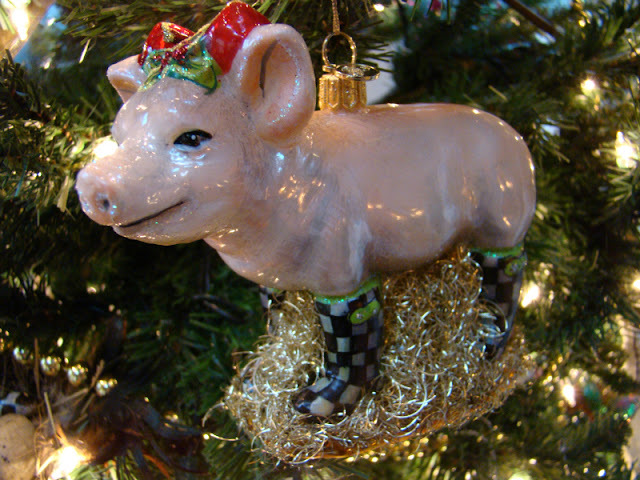 I added this Pig in Boots from the Mackenzie-Childs Farmhouse collection to tree this year. 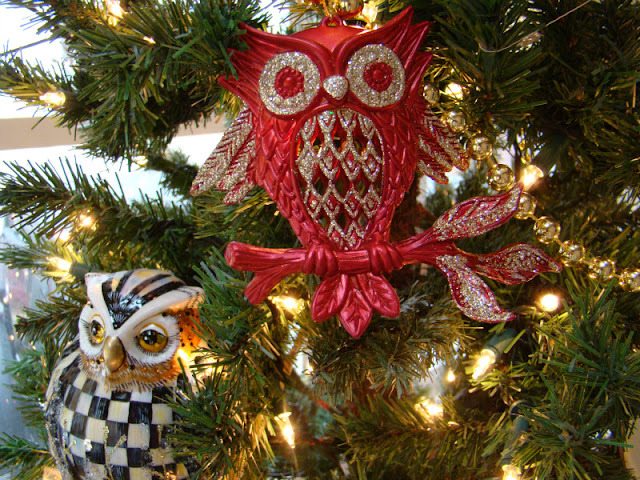 The red owl came from the Cracker Barrel store this year. The felt doggie on the left is from the Mackenzie-Childs compliments line, and is a few years old. I added some holly from the Dollar Tree that got a black and white checked makeover with duct tape. 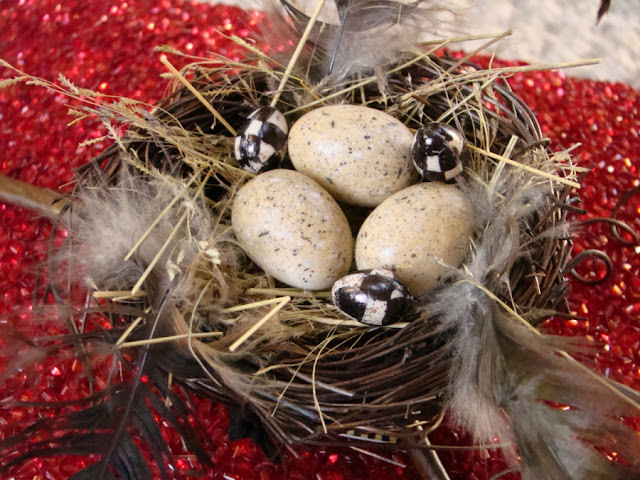 I hand painted little eggs in the Courtly Check pattern and added them to a Mackenzie-Childs nest from their Compliments line. 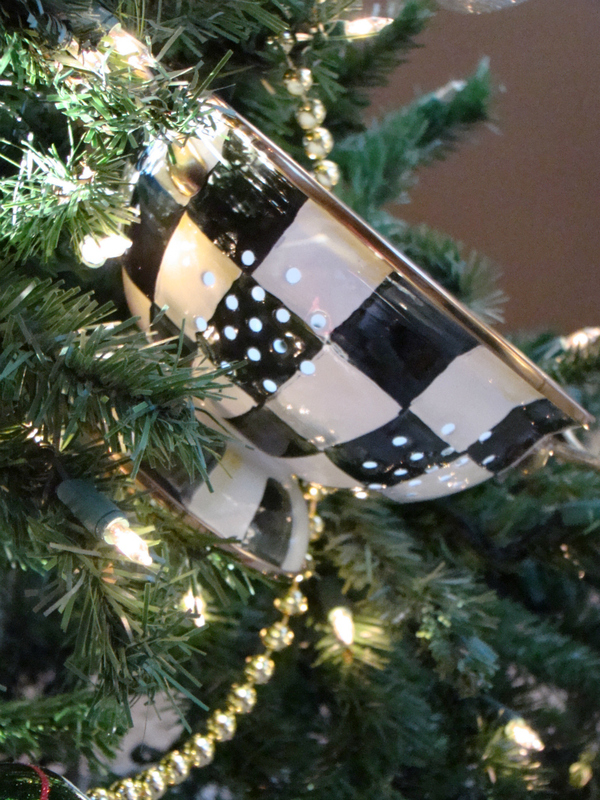 I added several Courtly Check ball ornaments, candles and enamelware pieces to the tree. The red dragonflies are for the owls to feast their eyes on. This year I decided to give the hall stairs a holiday makeover. Joe cut out the houses from oak, and sanded them well, primed and painted. I added some bottle brush trees from my Dickens Village collection that I haven't put up yet. Mackenzie-Childs does a wonderful job decorating their trees for the holidays. The photos above are from their New York City store, and I am looking forward to visiting during the Christmas break. I get most of my Mackenzie-Childs items at the annual barn sale which is held in Aurora, NY in the summer. I'll let you know the date as soon as I know. I am joining The Tablescaper for Seasonal Sundays. What a wonderful collection you have! The tree is beautiful. Hi Debbie, your home is beautiful . . . Love your tree and the little touches to the stair-steps is genius :) how creative you are!!! Bravo! 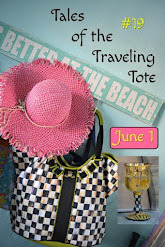 I'm having my first give-away next week so come visit and enter. Looks beautiful, Debbie. I came home with the Farmer Santa. He's adorable! Love this eye candy!! Beautiful! You won't know the barn Sale date until 2-3 before - it's their best kept secret!! 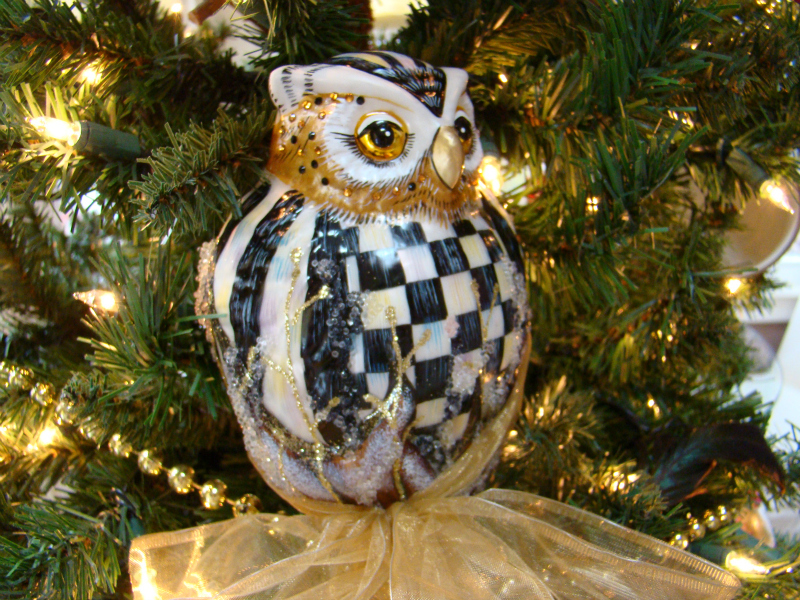 Oh Debbie, thanks for showing some of the detail and special ornaments on your tree. I love how you added the duct tape to the $ Tree holly and painted the little eggs. 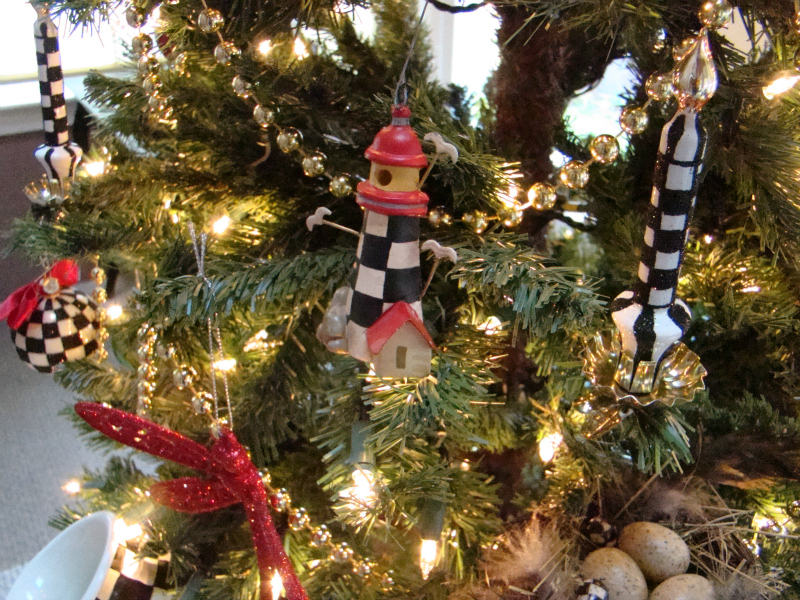 I especially love the KA ornament. 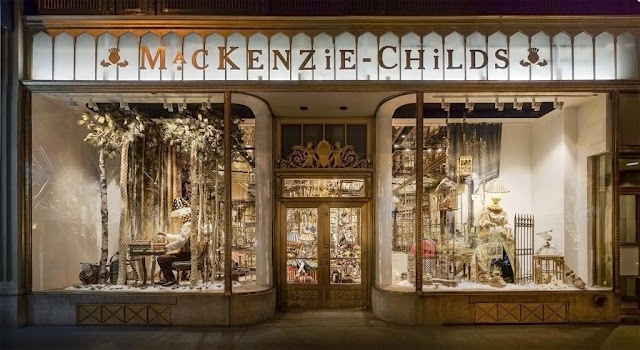 I never even heard of Mckenzie-Childs until your blog. It's wonderful!! You and Joe did a great job on the little houses!! Beautiful tree, Debbie! 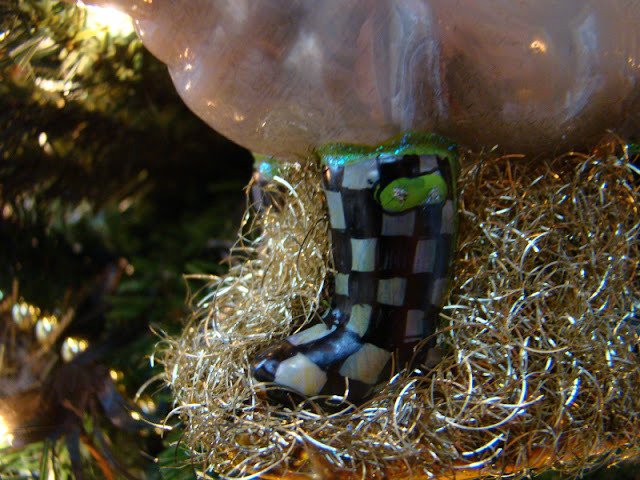 That little pig is adorable in his checked boots :) So, there is really black and white checked duct tape?? I'd love to find some! If you just felt a massive rumbling and heard all the china in your china cabinet rattling, don't worry...it's not an earthquake. That was just me jumping up and down at the sight of your cool tree!!!! (I've put on a couple of pounds!) What a gorgeous, gorgeous display!!! 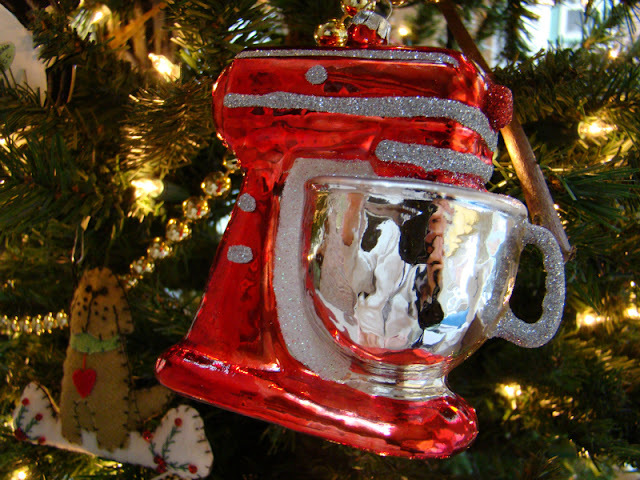 The ornaments are so unique and so fun. The pig is definitely my favorite, although the bird's nest is a close second. And you and I were thinking right along the same lines this year with our toppers! Gorgeous job, Debbie! 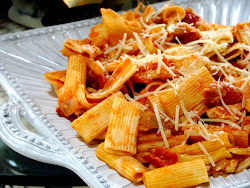 I KNOW you are going to enjoy this holiday season!!!!!! Your tree is beautiful Debbie! You have an amazing Mackenzie-Childs collection! 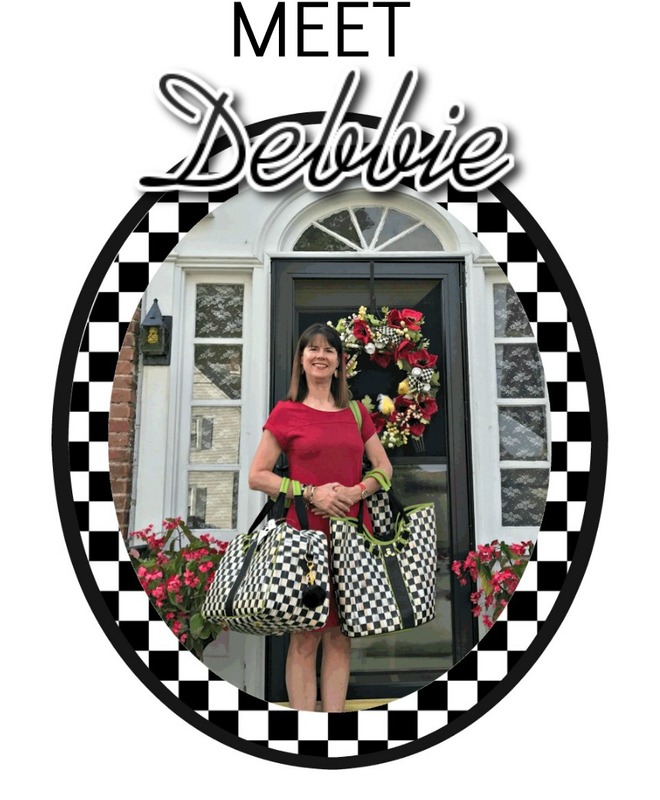 Debbie, I am in love with it all and I love that you made some of it yourself - duct tape? You are amazing. What a great idea!!! Of course the table is the scene stealer. I have, have, have to travel out for the barn sale someday!! !